Get an in-depth look at the all new drum layering plugin by Sample Magic called Stacker which captures the power of synthesis and sampling. Sample Magic has earned a strong reputation as being one of the world’s leading provider of professional sound samples, instrument presets, musical components, music production resources, and software to producers across a wide range of genres. 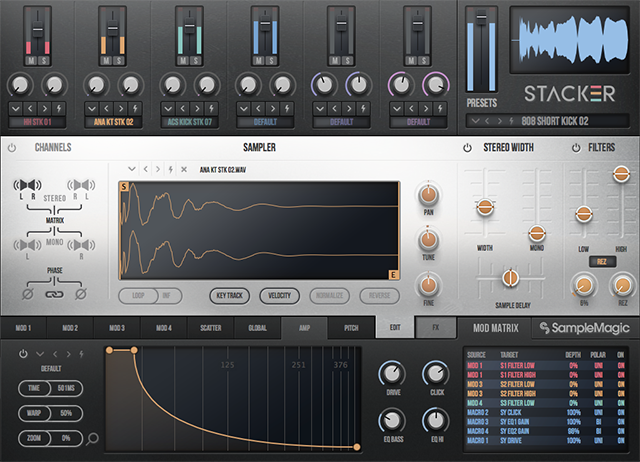 The latest addition to their award-winning products captures the power of synthesis and sampling to deliver a truly unique drum layering plugin called Stacker. Stacker is the ultimate drum layering plugin that uses synthesis and sampling across multiple layers to craft an extensive range of tailor-made sounds from cutting-edge drums, intricate percussion, and complex rhythmic tones to lush chords and cinematic-style effects. Stacker boasts some serious sound sculpting features such as three independent samplers, a fully equipped analog-style drum synthesizer, a suite of insert FX, a modulation matrix, smart global editing, freeform curve-enhanced envelopes, and a host of other innovative tools. At the core of Stacker is the Sample Layer section. The Sampler is where you sculpt custom sounds with ease by importing up to three different audio samples and editing them with various parameters. Quickly shape samples to your exact requirements using assignable start, loop and end points, silky smooth filters, expression controls, and a pervasive set of phase correction and stereo width tools. Stacker’s synth engine is driven by a robust modeled analog oscillator with a separate noise generator for constructing sonically rich drum sounds and effects. It can even be used to program bass and leads sounds. The synth offers a single oscillator for generating variable waveforms between a triangle, sine, and square wave shapes. Give your sounds some character by adding punch with the DRIVE circuit or mixing in an 808-style transient for exciting dull sounds using the CLICK generator, and then tuning the results to your track with the TUNE knob before sculpting it further with the Amp and Pitch envelopes. In addition, the NOISE circuit offers a color selection, a multi-mode filter with resonance, a stereo width control, and a noise envelope. Both the SYNTH OSC and NOISE generator are mixed together and routed through the FILTERS and Insert FX sections for additional processing. Shape your sounds with precision using Stacker’s ultra-flexible envelopes and curve controls. Load a preset or program your own nuanced curves using the fully-editable 8-point Amp envelopes to control amplitude, pitch, and modulation. Zoom in for fine tuning and sculpt your sounds with greater detail using the TIME control to edit the length of a sample, and WARP to create instant transient variations. The Pitch envelope has the same functionality as the Amp envelope, and can be accessed by clicking the PITCH tab. Design sounds that work harmonically in your projects by moving the semitone points for pitch-perfect accuracy. In addition, you can load, browse, and save envelope shapes using the Envelope drop-down menu. Digitize: Offers a variety of lo-fI effects to sounds. Clip Filter: Combines a multi-mode filter and a distortion unit that features seven models from tube overdrive through soft clipping to complex wave-folding. Zero Flanger: Alters a sound by introducing a varying phase shift and delay to add movement to the sound. Mod Shift: Choose from either a ring modulator (RM), or a frequency shifter (FS) to add extra harmonics to the sound. Two-band EQ: Offers low-shelf, high-shelf, and peak models with up to 12dB of gain for boosting or cutting. Filters: The analog-style filters round out the sound with Low and High controls. In addition to Insert FX, Stacker also sports a fully customizable delay and reverb Send FX engine that is accessed through the last two channels on the mixer. The delay features two separate models, tape-style echo and digital repeats along with a host of tweaking parameters to dial in your delay effects. The reverb effect uses Impulse Response files (IRs) to add various types of ambience to a sound, from classic room and hall reverbs to special effect textures. Both Send FX also have a Pump Envelope section for fine-tuning complex ghost grooves and slapbacks. The Scatter editor is one of Stacker’s secret weapons. This brilliant feature enables you to offset the start of each sample and synth layer so that they trigger at different times. This intelligent time displacement is indispensable for creating wide clap stacks, crescendo effects, and more. The colorful Mod Matrix provides 11 different sources and over 90 targets for adding some serious dynamic motion and expression to your sounds. You can control nearly every parameter in Stacker or even control up to nine different parameters at once. When the Target is set, its color changes to match the layer for easy reference. Make the magic happen by using the many sound manipulation options to take your sounds to new levels. This section also features four independent modulation envelopes and a set of four Macros to control one or more parameters through a specific, pre-defined range. Quickly access global controls on a single intuitive panel for on-the-fly tweaking. The central light color panel shows high and low cut filters for each layer, along with resonance dials for each channel, while the dark panel lets you delve deeper into advanced sound design options. 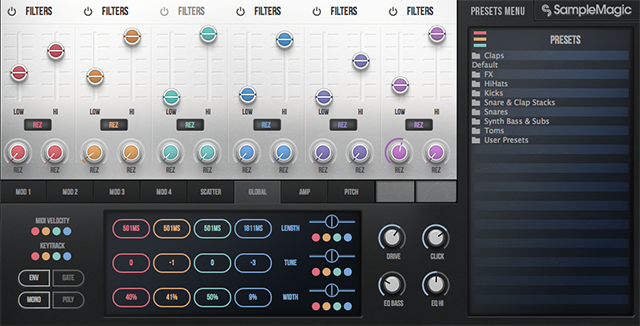 Here you can access essential layer parameters for each of the sampler and synth layers. The Presets Menu to the right is where you browse through over 1,200 expertly crafted presets including professionally crafted drum sounds, raw samples, tried and tested envelope curves, IRs, Macro assignments, effects racks, and more. Quickly swap and tweak presets or click the ‘lightning bolt’ button for intelligently randomized starting points. For more inspiration browse the Stacker XPansions from Sample Magic. Stacker + 1,200 presets available to download at Sample Magic. Compatibility: PC and Mac in VST/AU/AAX formats.